*Price with coupon code APINSIDER. Systems qualify for no interest when paid in full within 12 months with the Adorama Credit Card. 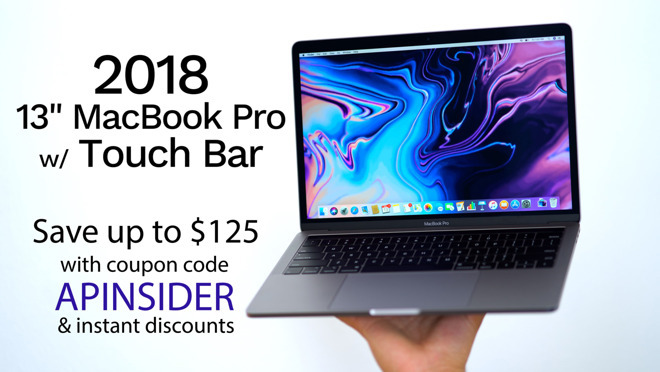 In what is the biggest discount on Apple's Mid 2018 13-inch MacBook Pro with Touch Bar, Apple authorized reseller Adorama is knocking $25 to $125 off every single CTO configuration exclusively for AI readers with instant rebates and/or promo code APINSIDER. These are the lowest prices anywhere for the current models when the coupon is stacked with Adorama's already reduced pricing. In addition to the bonus discount, shipping is free and each MacBook Pro qualifies for no interest financing when paid in full within 12 months using the Adorama Credit Card. 2.3GHz Core i5 systems 8GB RAM 13" MacBook Pro w/ Touch Bar (2.3GHz 8GB 256GB) Space Gray: $1,689 ($110 off) 13" MacBook Pro w/ Touch Bar (2.3GHz 8GB 1TB) Space Gray: $2,349* ($50 off) 13" MacBook Pro w/ Touch Bar (2.3GHz 8GB 2TB) Space Gray: $3,149* ($50 off) 13" MacBook Pro w/ Touch Bar (2.3GHz 8GB 2TB) Silver: $3,149* ($50 off) 16GB RAM 13" MacBook Pro w/ Touch Bar (2.3GHz 16GB 256GB) Space Gray: $1,949* ($50 off) 13" MacBook Pro w/ Touch Bar (2.3GHz 16GB 256GB) Silver: $1,949* ($50 off) 13" MacBook Pro w/ Touch Bar (2.3GHz 16GB 512GB) Space Gray: $2,149* ($50 off) 13" MacBook Pro w/ Touch Bar (2.3GHz 16GB 512GB) Silver: $2,149* ($50 off) 13" MacBook Pro w/ Touch Bar (2.3GHz 16GB 1TB) Space Gray: $2,549* ($50 off) 13" MacBook Pro w/ Touch Bar (2.3GHz 16GB 1TB) Silver: $2,549* ($50 off) 13" MacBook Pro w/ Touch Bar (2.3GHz 16GB 2TB) Space Gray: $3,349* ($50 off) 13" MacBook Pro w/ Touch Bar (2.3GHz 16GB 2TB) Silver: $3,349* ($50 off) 2.7GHz Core i7 systems 8GB RAM 13" MacBook Pro w/ Touch Bar (2.7GHz 8GB 256GB) Space Gray: $2,049* ($50 off) 13" MacBook Pro w/ Touch Bar (2.7GHz 8GB 256GB) Silver: $2,049* ($50 off) 13" MacBook Pro w/ Touch Bar (2.7GHz 8GB 512GB) Space Gray: $2,249* ($50 off) 13" MacBook Pro w/ Touch Bar (2.7GHz 8GB 512GB) Silver: $2,249* ($50 off) 13" MacBook Pro w/ Touch Bar (2.7GHz 8GB 1TB) Space Gray: $2,649* ($50 off) 13" MacBook Pro w/ Touch Bar (2.7GHz 8GB 1TB) Silver: $2,649* ($50 off) 13" MacBook Pro w/ Touch Bar (2.7GHz 8GB 2TB) Space Gray: $3,424* ($75 off) 13" MacBook Pro w/ Touch Bar (2.7GHz 8GB 2TB) Silver: $3,424* ($75 off) 16GB RAM 13" MacBook Pro w/ Touch Bar (2.7GHz 16GB 256GB) Space Gray: $2,274* ($25 off) 13" MacBook Pro w/ Touch Bar (2.7GHz 16GB 256GB) Silver: $2,274* ($25 off) 13" MacBook Pro w/ Touch Bar (2.7GHz 16GB 512GB) Space Gray: $2,449* ($50 off) 13" MacBook Pro w/ Touch Bar (2.7GHz 16GB 1TB) Space Gray: $2,799* ($100 off) 13" MacBook Pro w/ Touch Bar (2.7GHz 16GB 2TB) Space Gray: $3,624* ($75 off) *Price with coupon code APINSIDER. System qualifies for no interest when paid in full within 12 months using the Adorama Credit Card. Add AppleCare You can easily tack on an AppleCare extended protection plan to these 2018 13-inch MacBook Pros for $269 by selecting the AppleCare option immediately after you press the "Add to Cart" button on Adorama's website.